Measuring the corner radius seems to be one of the biggest challenges customers face. Let’s try to make it easy for you to understand and get an accurate measure for your own tub. This picture shows a hot tub with a five inch radius corner. 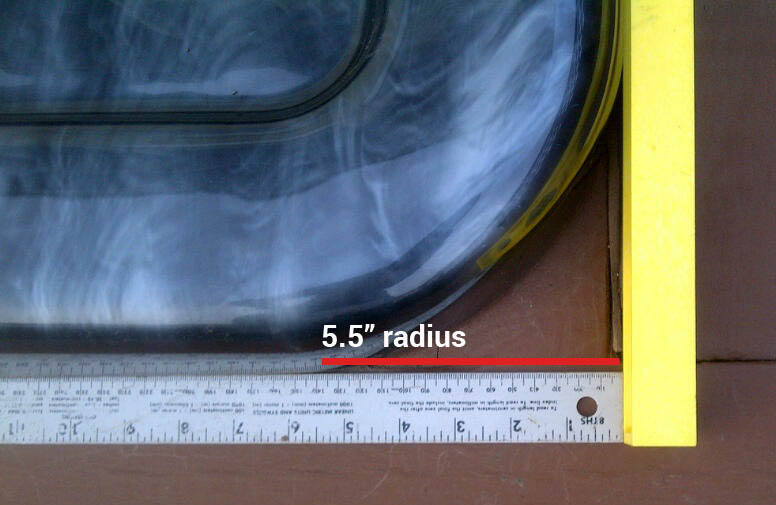 Actually, it’s more like a 5.5 inch radius, and in fact it’s wise in this example to round up a half inch. A slightly larger spa cover will ensure some looseness as they do tend to shrink over time. As an added bonus, a slightly larger cover makes it easier to pull the skirt snug around the edges. The part of the cover hanging around the side/bottom is known as the skirt. It’s mostly there for cosmetic reasons, but also helps prevent heat loss when it fits properly. Too long, and it might bunch up and prevent the cover from fitting well. Too short, and it won’t do much good at all. If you have a wood rail, as shown in the diagram above, measure from the top of the wood rail to the top of the spa’s acrylic part. If your spa doesn’t have a wood rail, you can measure from the top of the spa to the bottom of the lip and add a half inch to the total. Use this guide to get a better understanding of the measurements you’ll need, and the various parts of the cover that are important to pay attention to when selecting a new one. Q. Can I supply you with the make/model of my hot tub for a new cover? A. You can, but we recommend measuring it yourself. We have standard manufacturer measurements for many popular spa brands, but your measurements are actually the most accurate. We have excellent testimonials about our fitment, and are confident we can supply you with a great new hot tub cover. Q. Do I measure the old hot tub cover, or the hot tub? A. Of course if you have the old spa cover, and you were happy with its fitment, use that as a guide. If you don’t have an old cover, or your old hot tub cover is too beat up, feel free to use the hot tub itself. It’s common for hot tub covers to shrink over time, so the hot tub enclosure is a good place to get accurate measurements. Q. Where should I measure? A. Look for the widest point and measure the length and width. Round up every measurement to the nearest half inch. BE SURE to note where the measurement lines start and end for the hot tub shape you have. In general, if the hot tub cover is slightly too big that’s OK. If it is a tiny bit too small, it won’t be a hot tub cover. Q. What do I do if there are raised areas on my hot tub cover? A. If you have a special feature in your hot tub cover, such as raised areas, corner pockets, or an odd shape, just contact us. We’ll be happy to take the special options you need and give our manufacturer specific instructions so you get exactly what you need. A. For additional information please email us at sales (at) hottubcoverdepot.com or use out contact page to send us a note.